The abominable act of this man has left many in big shock and disbelieve. 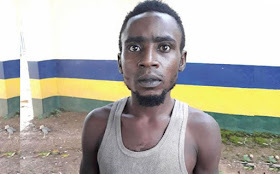 A 32-year-old man in the Kaura area of Kaduna State, David Shakari, has been arrested by operatives of the Inspector-General of Police Intelligence Response Team for r*pe. The 32-year-old father of one reportedly r*ped his mother and ex-wife’s mother who are in their 50s and 60s respectively. It was learnt that Shakari had attended a festival sometime in August 2017 in the community and returned home drunk in the night. Shakari, who lived with his mother, reportedly met the woman asleep and forcefully had s*x with her. He was said to have begged his mother the following day when he regained his senses and promised not to repeat the act. About three months later, it was gathered that the secondary school leaver attended another festival in his ex-wife’s community in Mahuta and got drunk again. He headed for his ex-in-law’s house in the night. The police said Shakari fled after r*ping his ex-mother-in-law and was given a chase by neighbours who were attracted to the victim’s cry. In an interview with our correspondent on Thursday, Shakari admitted r*ping his mother but said he had not penetrated into his ex-wife’s mother’s private parts before she raised the alarm. He said he went into farming after he completed secondary school, but he became tired of the work after some years. The suspect explained that he had enough time to laze about as he could not get another job. He said, “I got married in 2002. My wife was in secondary school then. It was agreed that she should complete her education at her parents’ home before she would move to my house. We have a child together. Later, she got remarried to another man. “I was into farming, but I did not like the work. I wanted to further my education. Last year, I attended Moroha Festival and got drunk. I went home and met my mother asleep. She was the only person at home. My father is dead and my daughter lives with her maternal grandmother. “I did not know when I r*ped my mother. The following day, a family meeting was held and I pleaded with her. She forgave me and I promised not to do such a thing again. A police source said that some vigilantes in Mahuta reported the incident to the IRT led by DCP Abba Kyari and a manhunt was launched for the suspect. “The effort of the team paid off last month when he was tracked down at Samunaka in the Dere area of Kaduna State. He r*ped his mother and his ex-mother-in-law,” the source added. Previous article El-Rufai picks Muslim woman as running mate?